I vividly recall this guest walking straight past me at the fishing hut one morning without saying a word as he proceeded to the water gauge where he stood watching it 'like a heron' for a good ten minutes to see what the river level was doing. When he finally came into the fishing hut he introduced himself as Mr Smith to which I replied I'm Mr Monteith but my real name is Jock and what's yours! 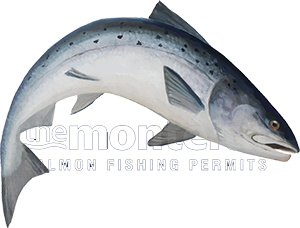 If you're waiting for the optimal river height to fish each individual salmon pool on any beat you'll wait a very long time indeed and if such conditions were present there are no guarantees that salmon will also be caught. The secret to successful Scottish salmon fishing is to have a game plan for all river height eventualities and forget about water gauge readings unless to record the water height when a salmon is caught. A big part of the magic of this pursuit is that you truly never know what will happen on any fishing day as salmon have a great knack of sneaking up on a salmon fly when it's least expected. Don't let your head go down if you arrive at any salmon river and the water level is much higher or lower than the last time you fished that beat and caught a salmon. The salmon lies move about with every varying 6 inches of water height 'lift or drop' so the key to the deal is understanding that principle which should be far more easily identified with the number one 'eye ball' and not some meaningless black digit on a white vertical plank. In over 40 years of my own personal salmon fishing obsession I've never ever seen a salmon studying a water gauge! The entire Scottish salmon fishing industry has been hijacked by 'water levels' & 'catch statistics' via agents who do not have the presentation skills to portray the natural magnificence of our rivers which is and always has been the more reliable attraction of Scottish salmon fishing. 'Let's see what's been caught' or 'let's see what the water height is doing' have kept many anglers away from thousands of salmon encounters as a water gauge that's higher or lower than the anglers expectations or no catches recorded which usually means a beat wasn't fished (or wasn't fished properly) have sadly taken over from good old 'natural river world' escapism. If you turn up on any salmon beat and you're not entirely satisfied with the level of water that's been delivered the customer services address to write to is; Mr G Almighty, 'Heaven' No 1 All Around Street, The Universe GA 777. Be careful though before you write your letter as customer services may well have placed one of their prized special reward bonuses in the river and within easy reach of your salmon fly so always make sure you check every aisle of the river store for any hidden special offers before you complain to the management! To my mind it's totally amazing to have such special riverine playgrounds where we can all wield about the latest fly line technology & rod actions with a small piece of Arctic fox tail tied onto the end in pursuit of these magnificent creatures. Embrace all fishing conditions before the heavens open up again and release a foot or two of fresh water to change and freshen up the salmon lies and even sometimes shuffles the riverbed stones around like a pack of cards. What a magnificent pursuit indeed and if it's presented professionally to any newcomer they will more than likely be in it for life and unlike golf at least the salmon fly is tied on!